Participation in sports offers tremendous social, emotional and physical benefits for children. We know that one of the worst things for kids is being on the sidelines with an injury. As parents and coaches, there are simple things we can do to help reduce preventable injuries – so our kids can continue playing the games they love. 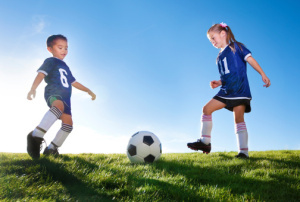 In 2012, more than 1.24 million children ages 19 and under were seen in emergency departments for injuries related to 14 commonly played sports. Before playing organized sports, make sure your child receives a pre-participation physical exam, or PPE, by a doctor. This can help rule out any potential medical conditions that may place your young athlete at risk. Bring a water bottle to practice and games. Encourage children to stay well hydrated by drinking plenty of water before, during and after play. Stretching before practice and games can release muscle tension and help prevent sports-related injuries, such as muscle tears or sprains. Make sure there is time set aside before every practice and game for athletes to warm up properly. Take time off from one sport to prevent overuse injuries. It is an opportunity to get stronger and develop skills learned in another sport. It’s also a good idea for coaches to get certified in first aid and CPR, learn the signs and symptoms of a concussion and help avoid overuse injury by resting players during practices and games.